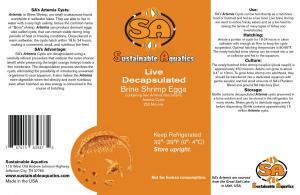 SA’s Artemia Cysts: Artemia, or Brine Shrimp, are small crustaceans found worldwide in saltwater lakes. They are able to live in water with a very high salinity, hence the common name of “Brine” shrimp. Artemia can produce dormant eggs, also called cysts, that can remain viable during long periods of heat or freezing conditions. Once placed in warm saltwater, the cysts hatch within 18 to 24 hours, making a convenient, small, and nutritious live feed. 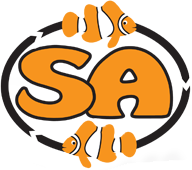 SA’S Advantage: Sa’s Artemia Cysts are decapsulated using a carefully-refined procedure that oxidizes the outer chorion (shell) while preserving the bright orange embryo inside a thin membrane. The decapsulation process sterilizes the cysts, eliminating the possibility of introducing unwanted organisms to your aquarium. 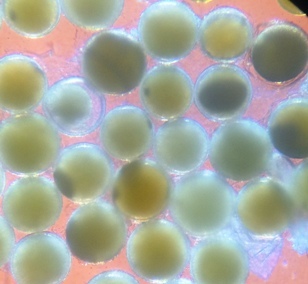 It also makes the Artemia more digestible when fed directly and more nutritious even when hatched, as less energy is consumed in the course of hatching. Use: SA’s Artemia Cysts can be fed directly as a nutritious food or hatched and fed as a live food. Live brine shrimp are used to entice finicky and as a live feed for raising the larvae of many types of fishes and invertebrates. Hatching: Aerate a portion of cysts for 18-24 hours in clean saltwater with enough air to keep to cysts suspended. Optimal hatching temperature is 80-85°F. The newly-hatched brine shrimp can be raised into a net or collector and fed to the aquarium. Culture: The newly-hatched brine shrimp nauplis (plural nauplii) is approximately 450 microns. Adults can grow to about 0.4″ or 10mm. To grow brine shrimp into adulthood, they should be transferred into a dedicated aquarium with gentle aeration and fed small amounts of SA’s Plankton Blend and ground SA Hatchery Diet. Storage: Bottle contains decapsulated Artemia cysts preserved in a brine solution and can be stored in the refrigerator for many weeks. Shake gently to distribute eggs evenly before dispensing. Bottle contains approximately 15 million Artemia cysts.